I had my heart set on going to Sephora while we were in Colorado last week, but alas, no Sephora in Denver. I think I did see that there was a JC Penney Sephora in Denver, but they don't carry all the brands in the Penney's shops. So I settled on going in to the Bare Escentuals shop on 16th Street. Now, I think I've told you before that I just can't wear BE foundation. I couldn't find a perfect shade match, it was a bit too oily for me, and worst of all, it made it itch. But I love all their other products. 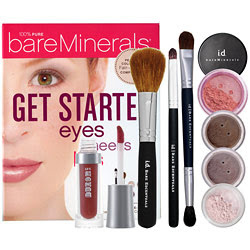 I saw their Get Started: Eyes, Cheeks, and Lips kit in Fair to Light ($49) and couldn't resist. So far, I love the eyecolors and the blush. And I am obsessed with the crease brush- I get perfect application of my darker color in the crease when I use this. Perfect. I have not gotten brave enough to try the liner shadow and liner brush yet. The lippie I am "meh" about. I typically like more pigment for a lipcolor, but this is a nice neutral that I can slop on to run into Target or something. It does smell fabulous. On a side note, the poor Politician is still battling his stomach woes. We went to church Sunday and he went to school Monday, but woke up this morning not feeling well. His class has a big field trip on Thursday, so I hope he feels better by then. He's really excited and I'd hate for him to have to miss that too, since he's already missed his Tball party and a birthday party. I have a love/hate relationship with Sephora. I LOVE going in there because there's such awesome stuff. But I HATE not having any $$ to get all the awesome stuff. I have the eye kit too, I love the brushes but don't use the eye shadow, it's 4 different colors and that's too much work for me. If you want to know who makes the best foundation try Laura Mercier, I think you can get it at Sephora now, but used to be only at Saks and Nordstroms. Anyway, still running, ditched the whole c25k thing, but now am training for a half marathon in Chicago on Sept 14. Looking forward to it, but so far I am only up to 5 miles, so I have a lot of training to do between now and then.